WASHINGTON, D.C. -- The average 79-percentage-point difference between Republicans' and Democrats' job approval ratings of President Donald Trump during his second year in office is the largest Gallup has measured in any presidential year to date. The prior record of 77 points was recorded in President Barack Obama's eighth year in office. During Trump's second year in office, which began Jan. 20, 2018, and ends Jan. 19, 2019, he averaged 87% job approval among Republicans and 8% among Democrats. Independents' views were closer to those of Democrats than to those of Republicans, with an average 36% of independents approving of Trump's performance in office. Compared with Trump's first year in office, his approval rating among Republicans increased four points, while there was no change among Democrats, resulting in a four-point-higher partisan gap. Extreme partisan views of presidents are the new norm in politics. The past 15 presidential years account for 14 of the top 15 most polarized years since Gallup began regularly measuring both job approval and party identification in the 1950s. These include both of Trump's years in office, all eight of Obama's, and four of George W. Bush's last five years in office. The only exception was Bush's final year, when his overall approval ratings were in the high 20s or low 30s, and the gap between Republicans and Democrats ratings shrank as Republican approval slipped to 67%. Bush's eighth year still ranks 16th all-time for party polarization, with Bill Clinton's 1996 re-election year holding the 15th spot. Overall, an average of 40.4% of Americans approved of the job Trump was doing as president throughout his second year in office, a slight improvement from his 38.4% average in year one. Trump's second-year approval ratings did not vary much in general, registering mostly in the low 40s. His high point was a personal best 45% in June after his historic meeting with North Korean leader Kim Jong Un. His low point in year two was 37% in February -- matched in the latest reading, taken during the ongoing partial government shutdown. Trump's year two approval average is the lowest for second-year presidents elected to office since World War II. Trump's year one average was also the lowest for a first-year elected president. However, the gap between Trump and the next-lowest president's average was smaller (just under three points) in year two than it was in year one (just under 11 points), because sub-50% approval ratings are more common for second-year presidents than first-year ones. Ronald Reagan had the previous lowest second-year average of 43.3%, while Jimmy Carter, Clinton and Obama also had approval averages in the 40s. Richard Nixon's second-year average was 56%, while the four other elected presidents averaged 65% or better. Trump's second-year average approval rating ranks 65th of 75 total presidential years since 1945. The 10 presidential years that were lower include Trump's first year; Carter's third and fourth years; Harry Truman's sixth, seventh and eighth years; George W. Bush's sixth, seventh and eighth years; and Nixon's sixth (and last) year. 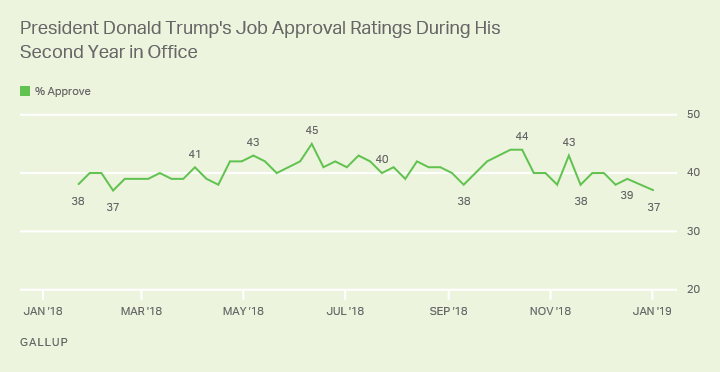 Trump has now registered the lowest first- and second-year job approval averages of elected presidents since World War II, and, at 39% approval in his presidency to date, is well on his way to having the lowest average approval rating for any president. Record political polarization is a big reason for Trump's lackluster ratings, particularly his consistent sub-10% approval ratings among Democrats. This ties most of the flexibility in Trump's ratings to the views of independents, which have yet to exceed 42%. The result of partisan rigidity is that Trump had no presidential honeymoon and has yet to benefit from a "rally event" leading to a sustained increase in approval. Consequently, his job approval ratings in his first two years have been much more stable than those of prior presidents. U.S. successes like record stock market values and low unemployment, Trump accomplishments like federal income tax cuts, and Trump shortcomings like unsuccessful attempts to repeal Obamacare and the government shutdown over the U.S-Mexico border wall have not done much to move the needle on Trump's approval. Trump's lofty approval ratings among Republicans make it unlikely that he will be denied the Republican presidential nomination in 2020, even if he is challenged by a fellow Republican in the primaries. 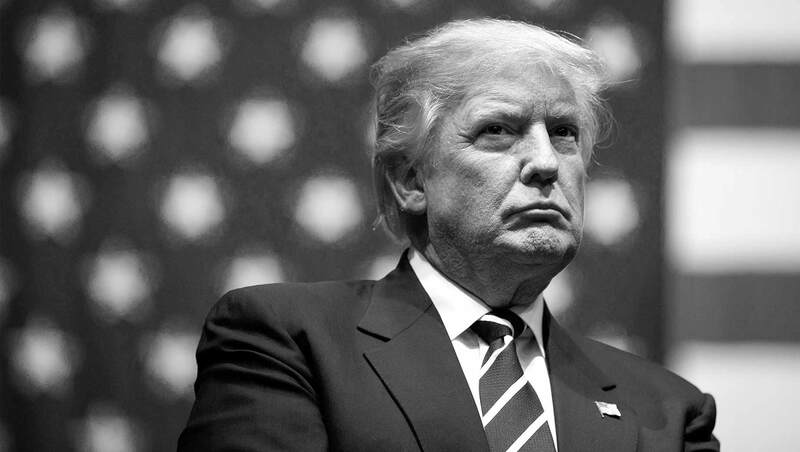 At the same time, his overall approval ratings in the 30s and subpar approval among independents currently give him long odds of winning the general election and a second term as president. Although Republicans may hold out hope that a Democratic presidential nominee who is either uninspiring or viewed as too ideologically extreme may aid Trump's chances of winning, presidential elections featuring incumbents are largely a referendum on the incumbent's performance rather than a choice between two competing options. Results for this Gallup poll are based on telephone interviews conducted between Jan. 22, 2018, and Jan. 10, 2019, with a random sample of 72,453 adults, aged 18 and older, living in all 50 U.S. states and the District of Columbia. For results based on the total sample of national adults, the margin of sampling error is ±1 percentage point at the 95% confidence level. For results based on the total samples of 21,340 Democrats, 20,685 Republicans, and 27,308 independents, the margins of sampling error are ±1 percentage point at the 95% confidence level. All reported margins of sampling error include computed design effects for weighting.